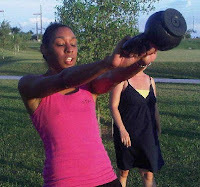 Synergy Kettlebell Boot Camp is a super fun and results guaranteed fitness boot camp using kettlebells and training in beautiful Gilbert, Arizona and now also in Aurora, Illinois. I get so excited and pumped by what we do that when I tell people who have never heard what a kettlebell is they definitely want to come try it out so they can have an amazing fitness experience, but before they come they are still are unsure of what actually takes place. Describing a kettlebell is easy... it's kinda like a cannonball with a handle, but how they are gonna use it to experience the absolutely greatest fitness experience ever is totally another story. So I put something together that's gonna help. Here's a brand spankin new video that lets YOU get a super special secret inside peek into what we do during our totally awesome Fat Blaster workouts.